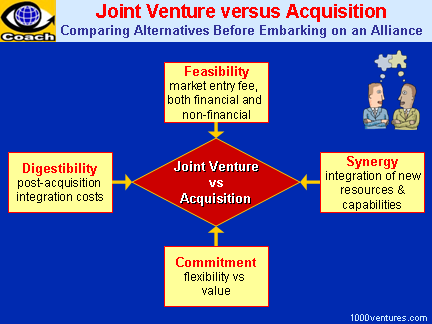 As there are good business and accounting reasons to create a joint venture (JV) with a company that has complementary → capabilities and resources, such as distribution channels, technology, or finance, joint ventures are becoming an increasingly common way for companies to form strategic alliances. In a joint venture, two or more "parent" companies agree to share and → synergize capital, technology, human resources, risks and rewards in a formation of a new entity under shared control. "Collaborate," – advises Georgann Occhipinti, President of Diamond Associates. "I periodically collaborate with another consulting firm as a way of developing my own. The group is comprised of other consultants and business owners with very diverse backgrounds. We work together a few times a year with specific clients and are able to immediately function as a very effective → team. It is a selfless experience in which egos are never an issue and each of us can rely on any other to lend support, solutions, and the latest industry knowledge. Simply put, this continues to be the best team that I have ever worked with, regardless of the member configuration or work content. I always look forward to working with this team, and it always exceeds my expectations. We all engage in complete collaboration from start to finish." Research indicates that 50 to 70% of all joint ventures fail. Not many CEOs of joint ventures characterized their venture as "very successful". As → Konosuke Matsushita the legendary founder of Panasonic, put it, "Business is people. Business success is achieved by getting each and every person in the organization to be more successful in the job they do. To maximize the chances of success, the prospective joint venture partners should first jointly prepare and agree on a business plan - even before signing the joint venture agreement. The business plan should also include the exit strategies, the terms of dissolution of the joint venture, mechanisms to resolve disagreements between the JV partners, contingency plans and the a process to → make changes in the business plan in response to the market changes and customer feedback. It is important to involve the key managerial and operating personnel in development of the business plan as they will best understand the details that need to be negotiated. A good agreement is critical to success of your venture. 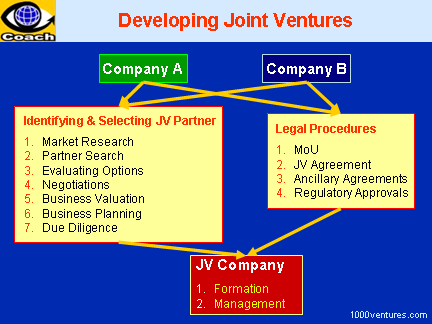 Once the business plan is finalized, preparing the joint venture agreement becomes much easier. Using a joint venture check-list will also help you prepare a sound joint venture agreement. Management of the venture-building process is fundamentally different from corporate management that is focused on delivering the annual operating plan. Management of a new high-growth business is build around a customer-driven idea or a technology. It requires → entrepreneurial → mindset and skills. Operating a joint venture with a foreign partner requires time, resources, and cross-cultural skills. Cultural intelligence and strategic thinking can be the prescription to avoiding errors in cross-cultural projects. As your joint venture has to compete in its market for people, customers and capital, its human resource, pricing, service, financial and other policies must be tuned to that market. "The resources you place under the control of JV should be only those that are unique to it needs. To minimize costs, all else should be drawn from your firms or bought from outside. "4 It is often tempting to take short cuts because of resources constraints and the need for speed. Nevertheless, if you wish to minimize the risks inherent in an international joint venture, you must manage the processes with great care. Mastering Alliance Strategy, James D. Bamford et al.